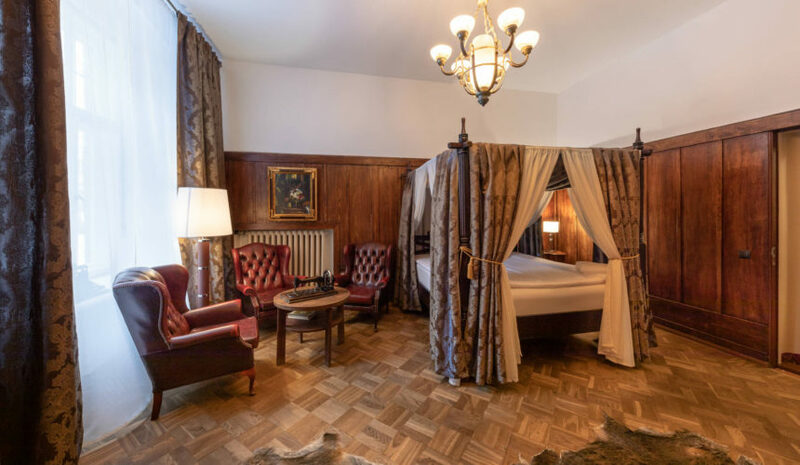 the art nouveau style castle (10 suites), in which the restaurants and spa and sauna complex are also located. 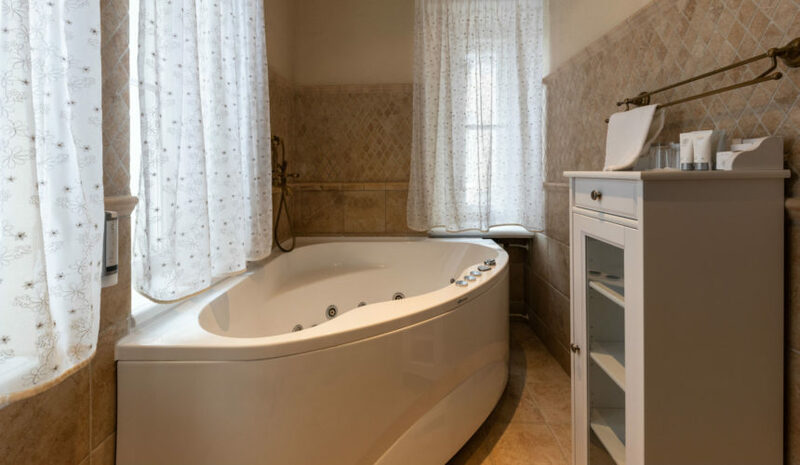 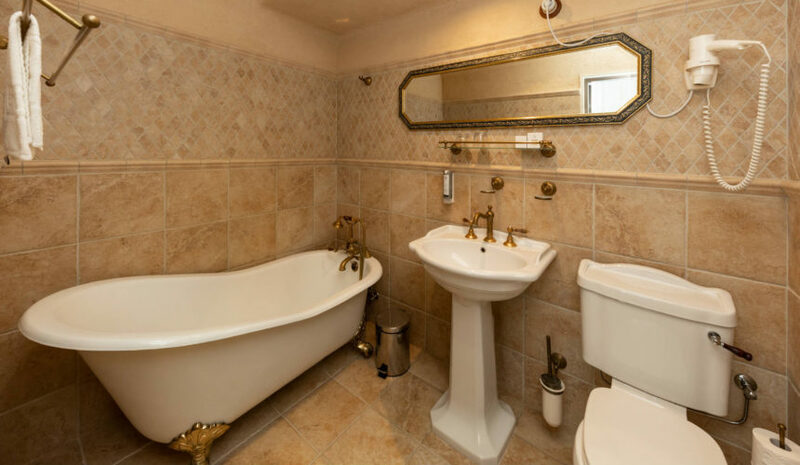 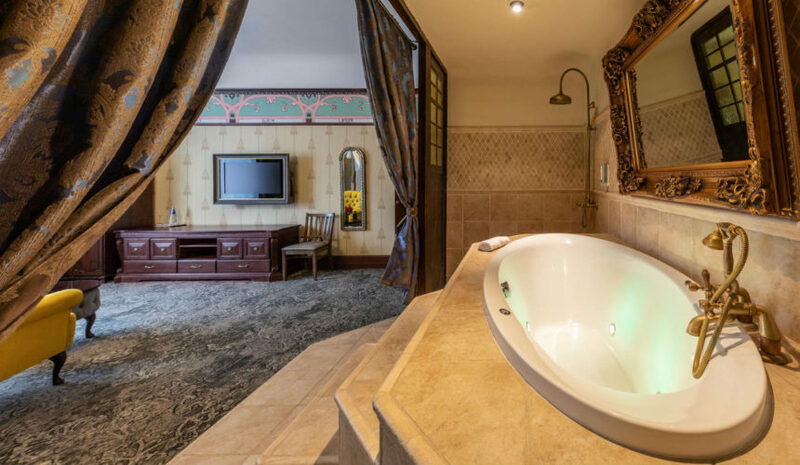 All of the suites located in the fairy tale castle are unique, with the majority having a 1 person retro bath and open bathroom. 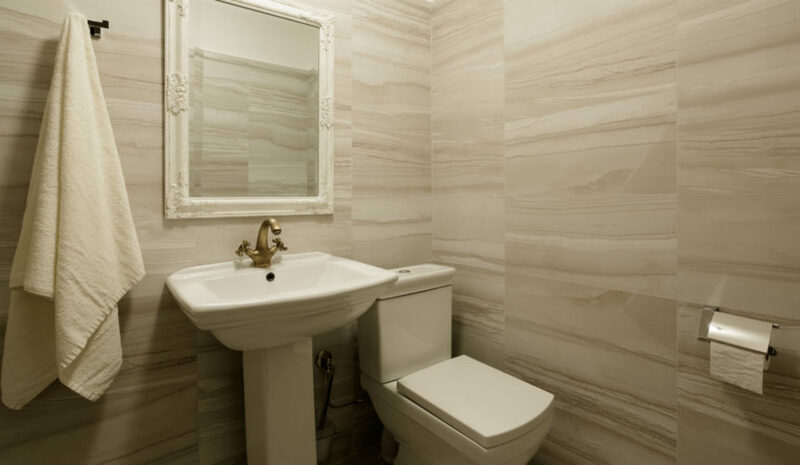 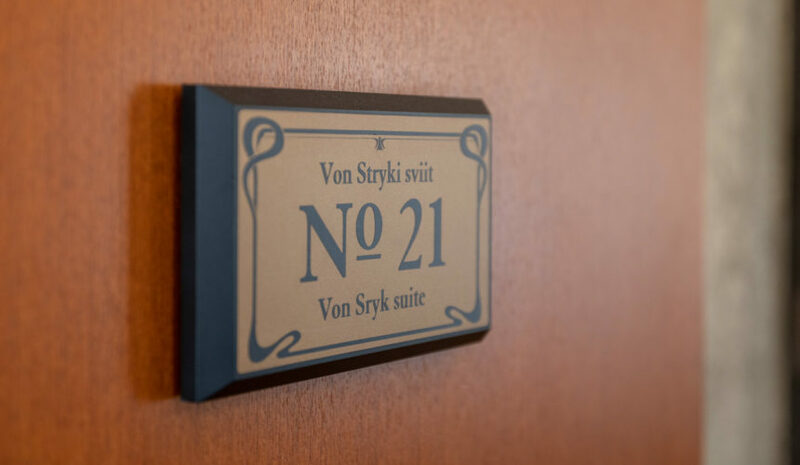 The architecturally exciting piano suite is located on the ground floor. 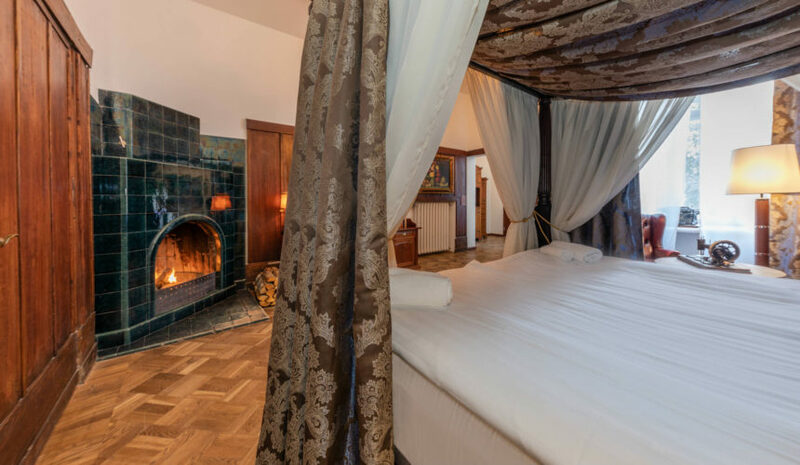 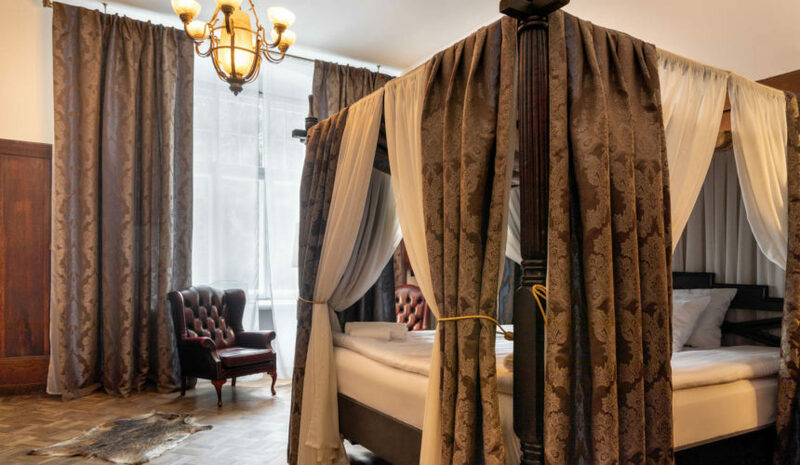 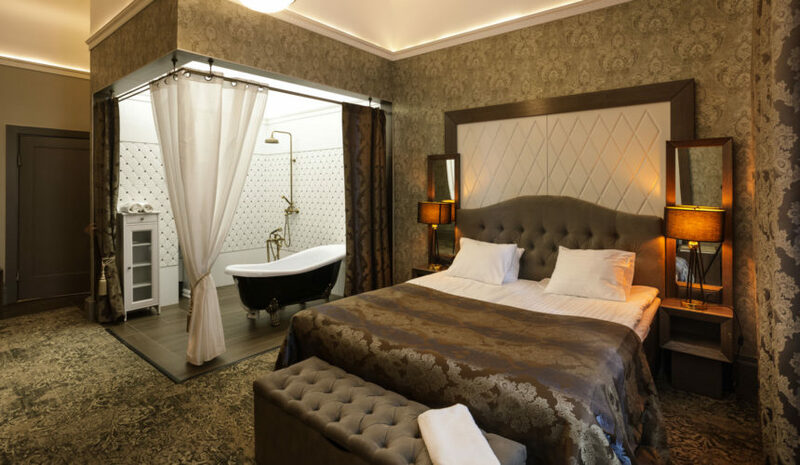 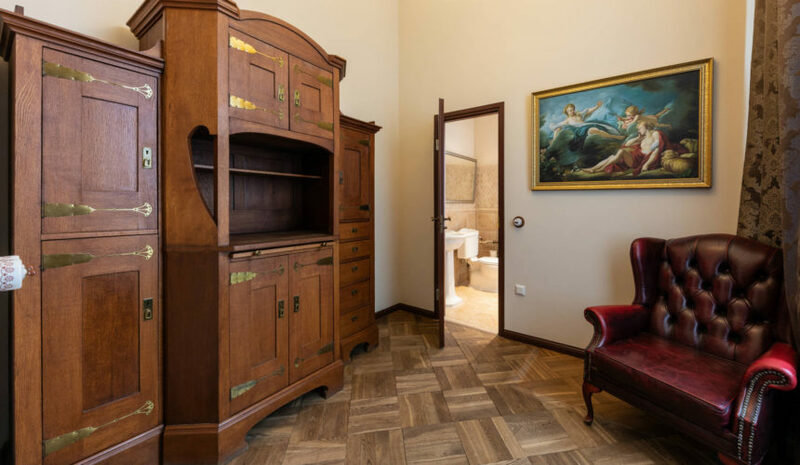 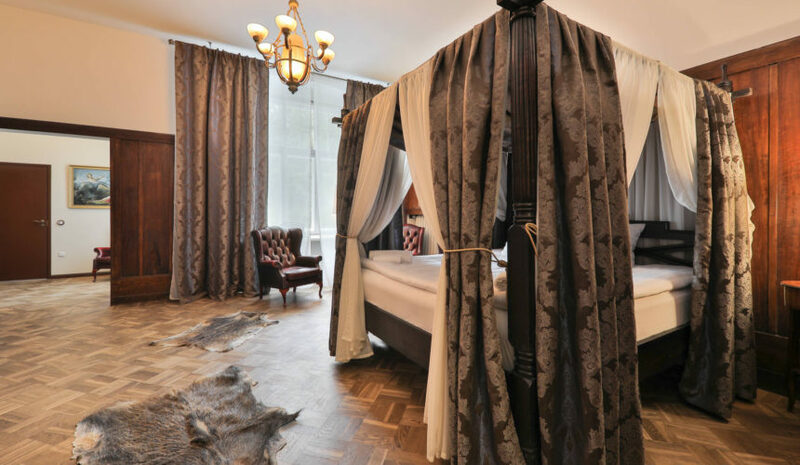 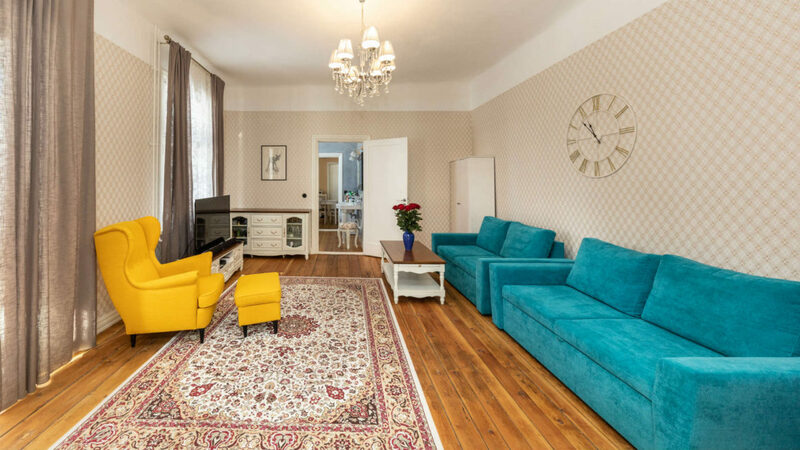 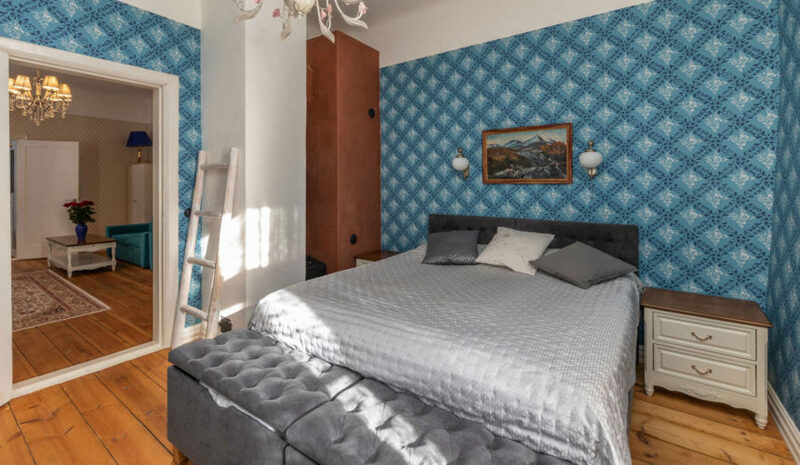 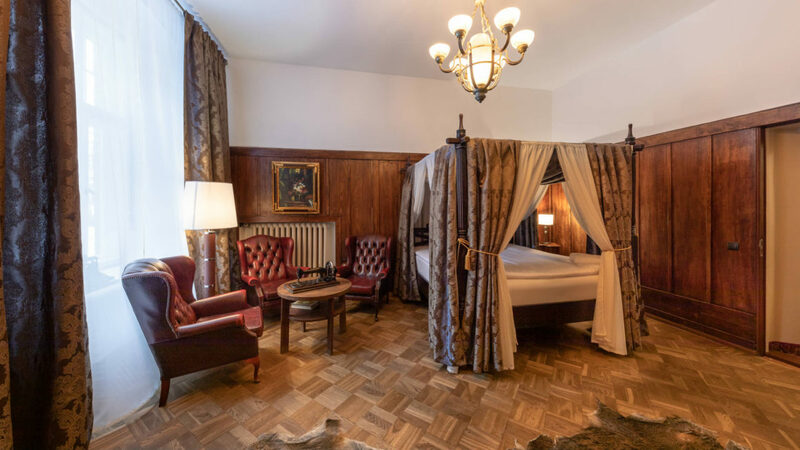 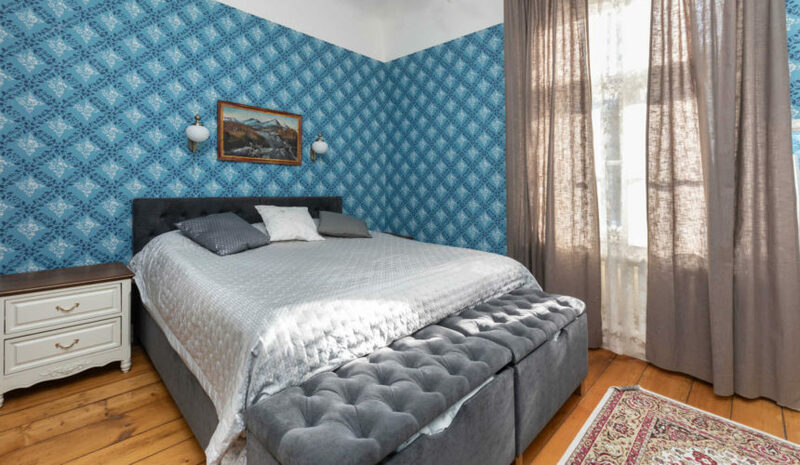 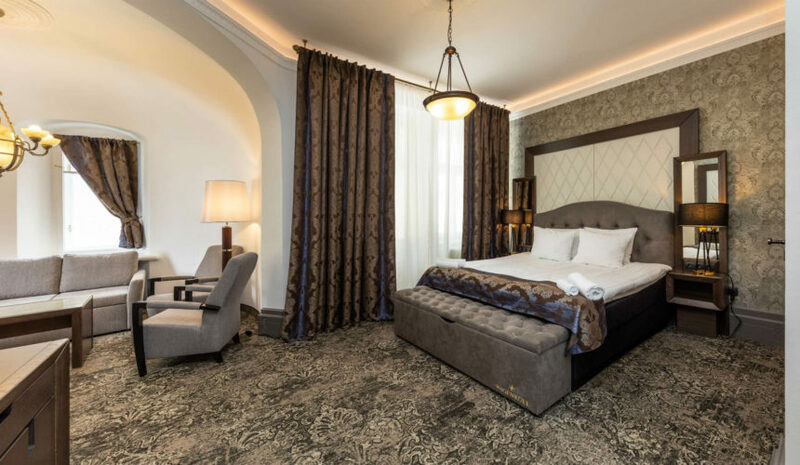 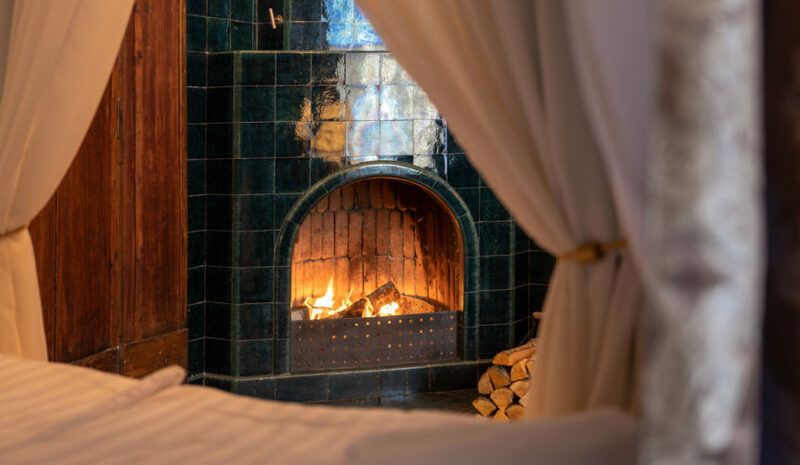 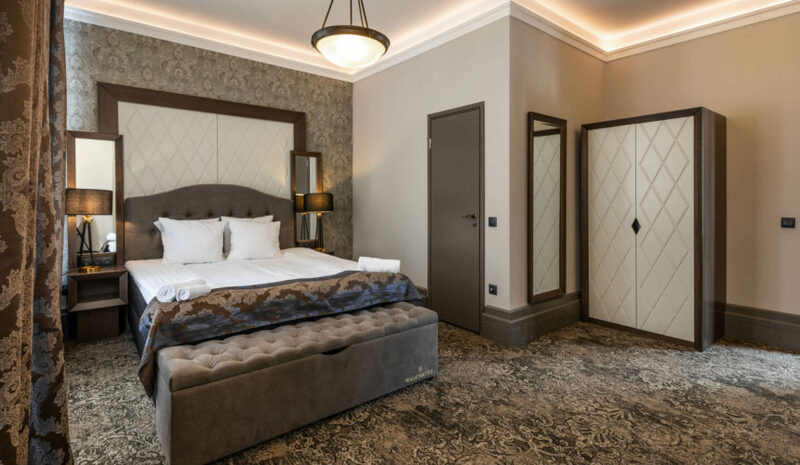 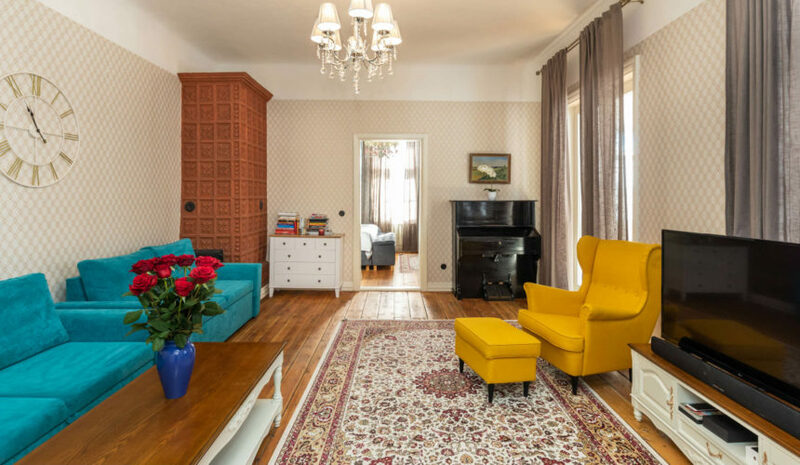 The suite was used as a workroom by the Baron during the manor period, and the suite’s interior incorporates wooden wall panels that are characteristic of the art nouveau style, with the room also having a four post bed, a fireplace and a Jacuzzi. 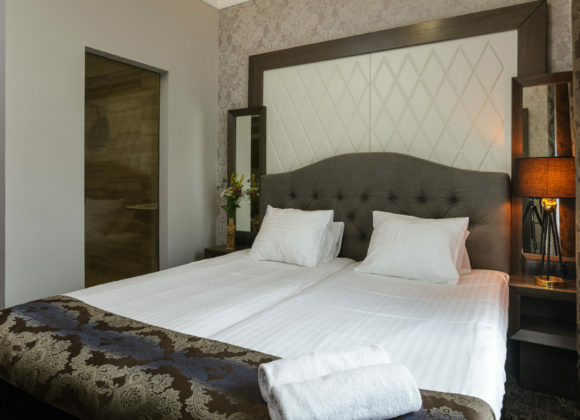 Located on the second storey of the castle is the historic von Stryk suite, which is the only room in the castle with a balcony. 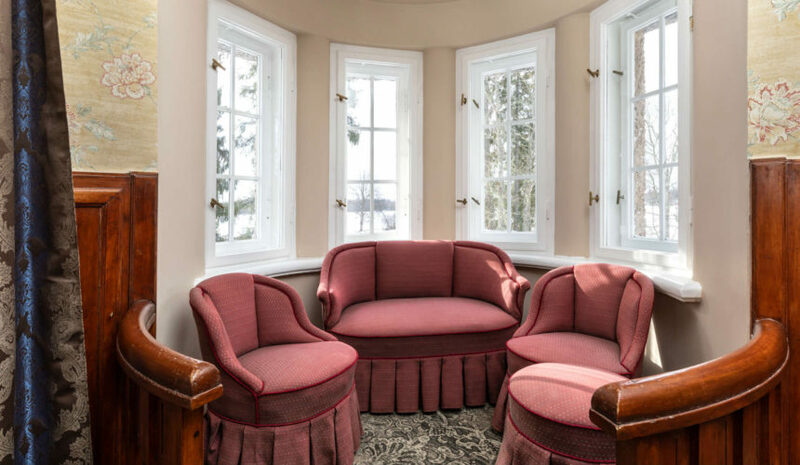 One exciting part of the room is the sitting area with armchairs built into the castle’s corner tower. 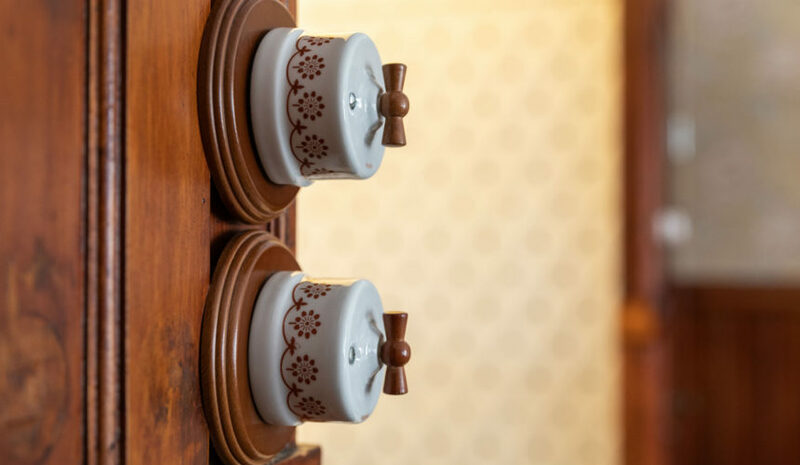 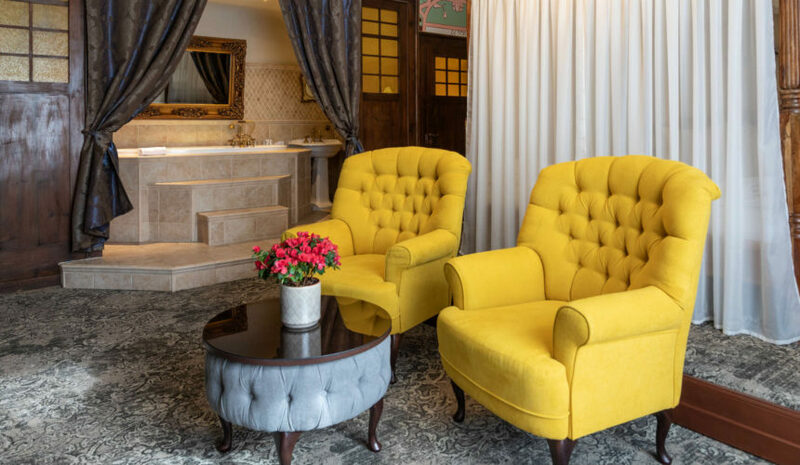 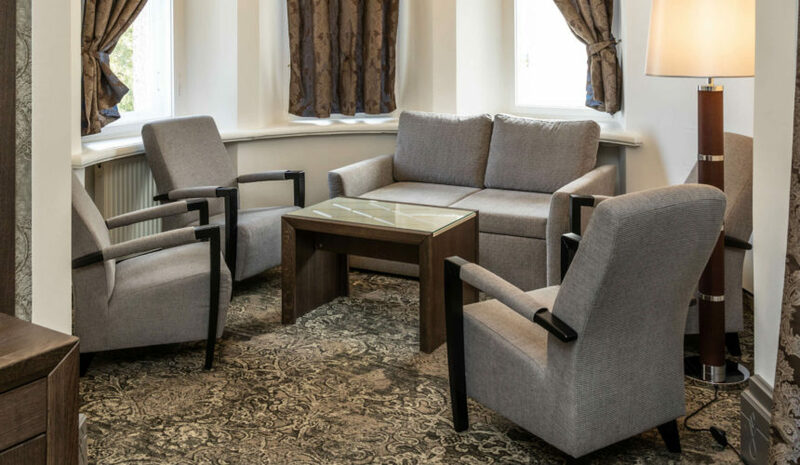 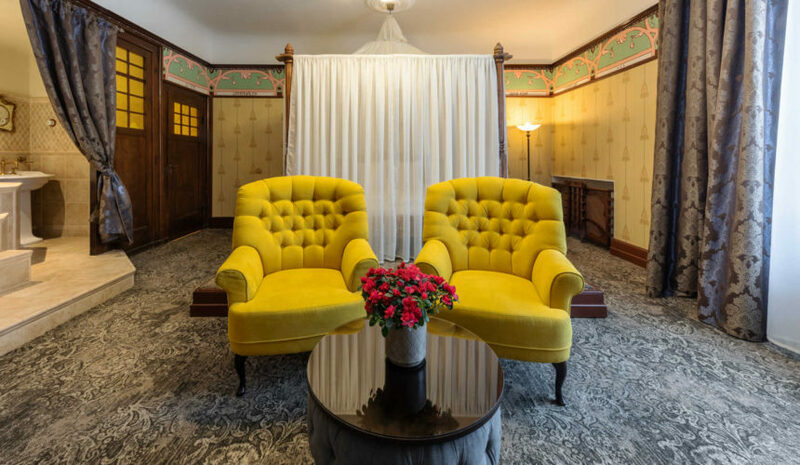 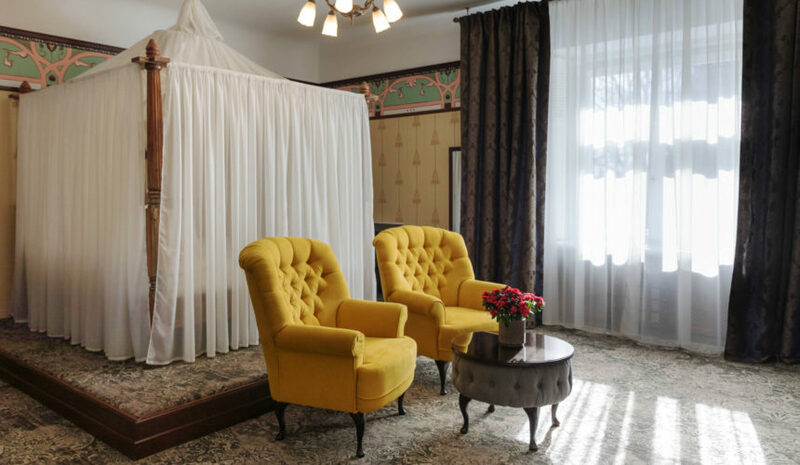 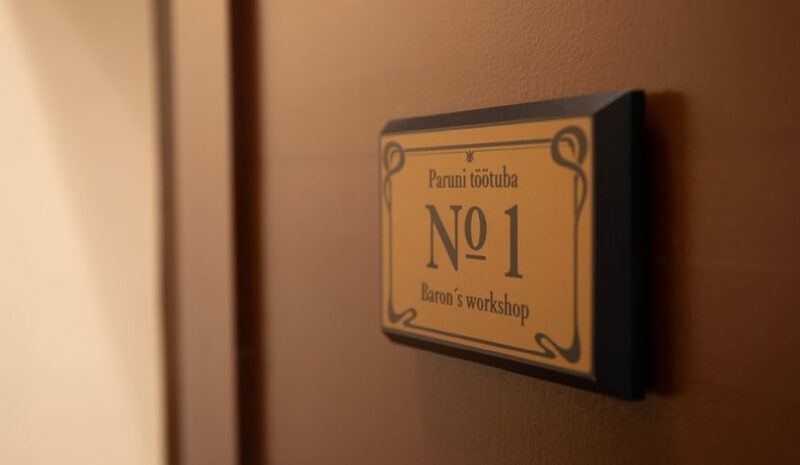 Added value is provided in the Baroness’s suite by the room’s wooden wall panels, which are characteristic of the art nouveau style, and the architecturally exciting sitting area in the castle’s corner tower, which is ideally suited for enjoying a cup of “five o’clock tea”. 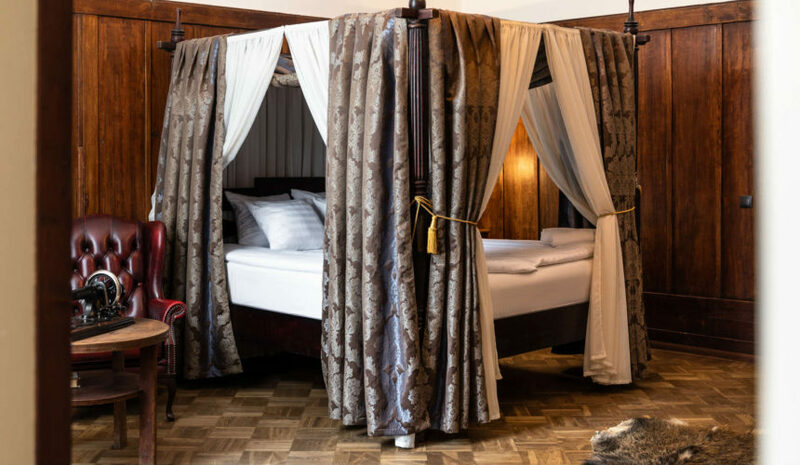 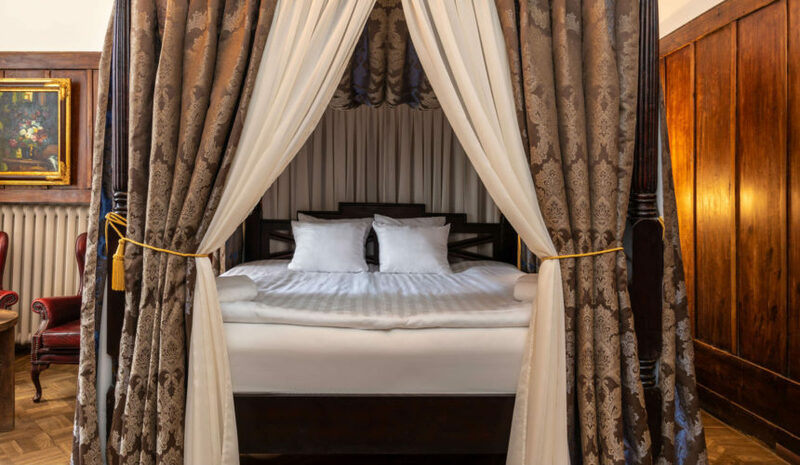 A four post bed and elements characteristic of the art nouveau style can be found in the Baron’s evening suite. 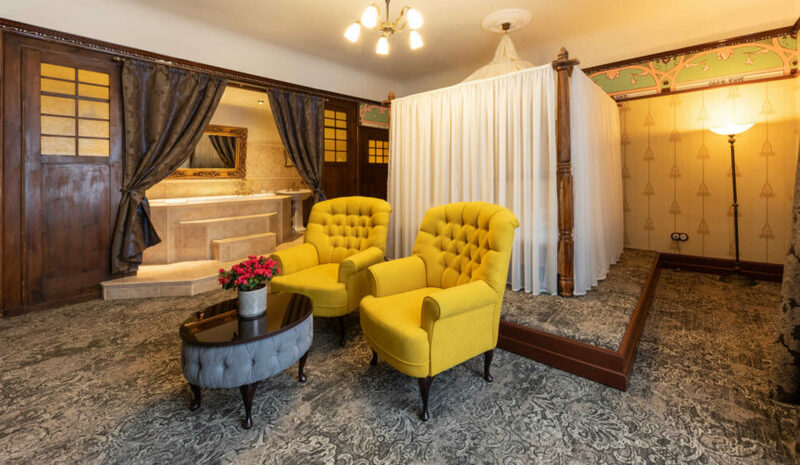 the Park House (1 two-room suite), which is connected to the castle’s spa and sauna centre via a tunnel. 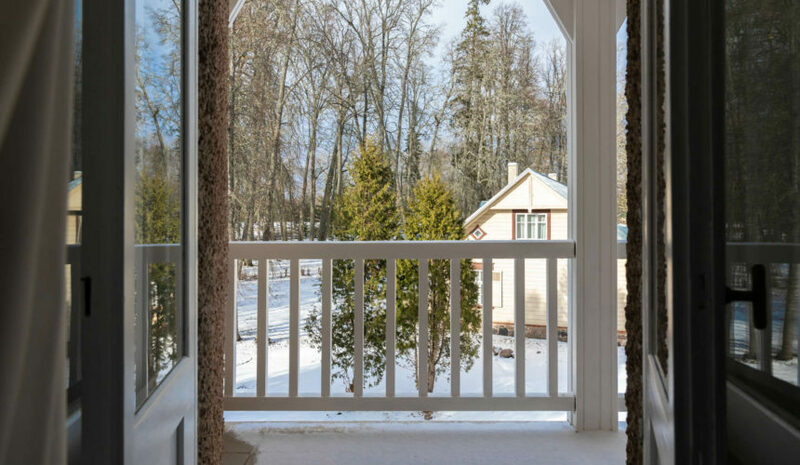 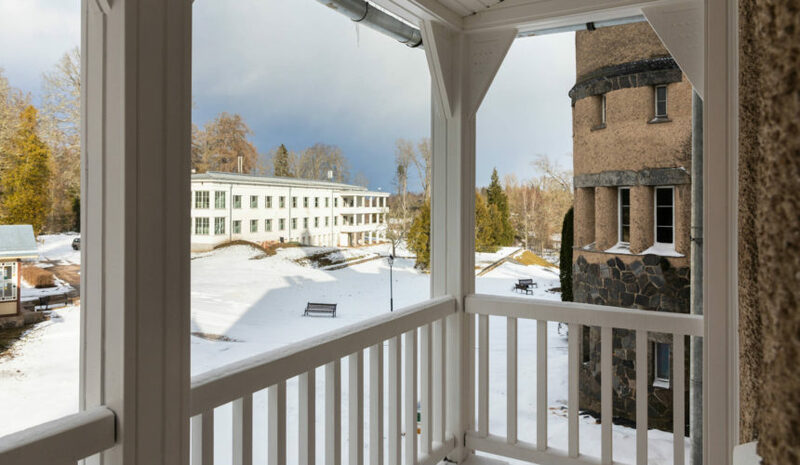 The suite located in the Park House offers an incredible view of the castle. 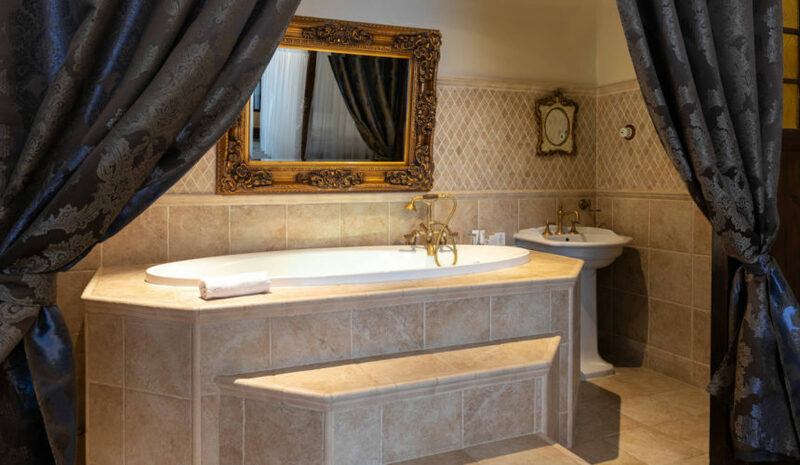 The suite is also suitable for organising private dinners and meetings for up to 6 people. 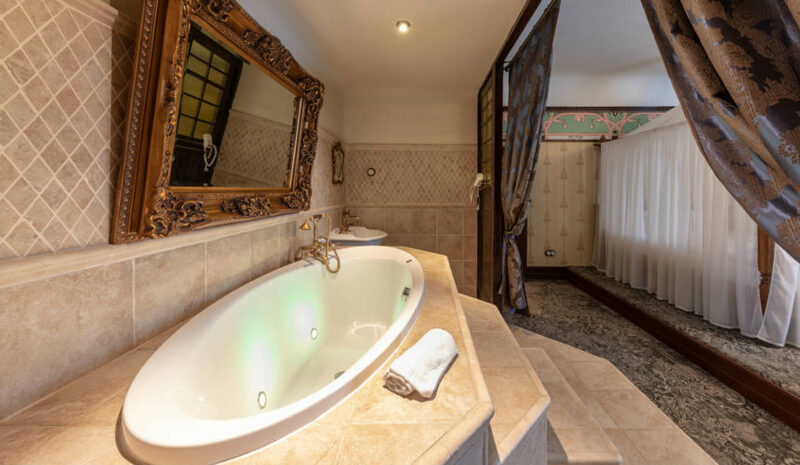 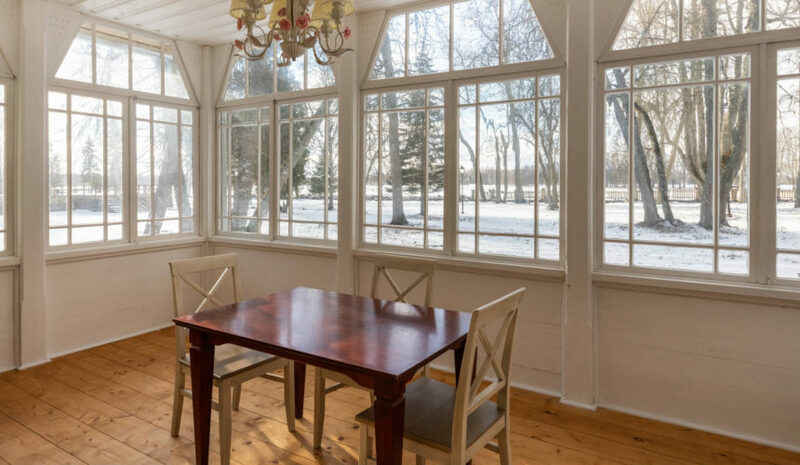 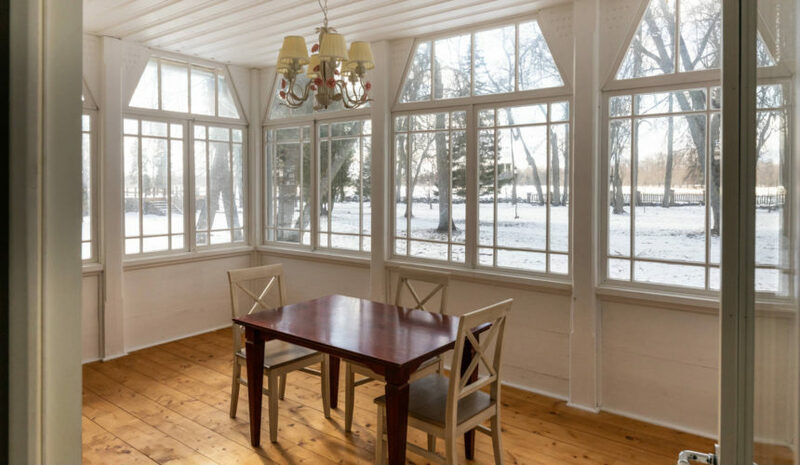 Located within the Governor’s House, with its beautiful wooden architecture, is one 3-room suite with a veranda and bath, comprised of a dining room, living room and bedroom, and which also has two private entrances. 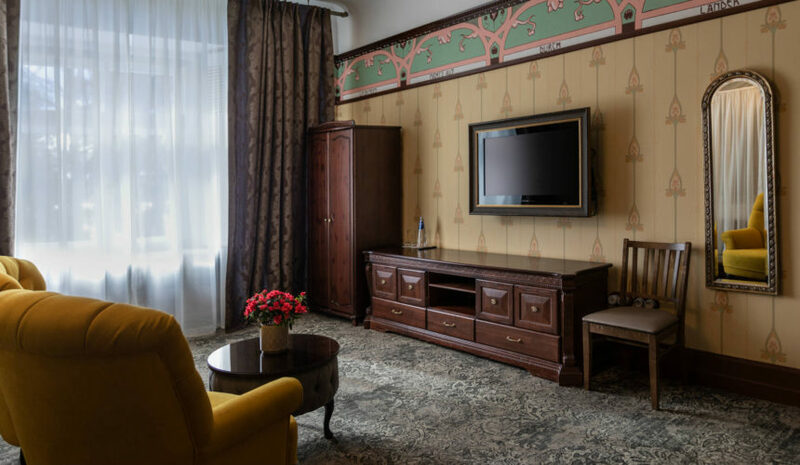 All suites come with a television, hair dryer, bath products, a bathrobe and slippers.  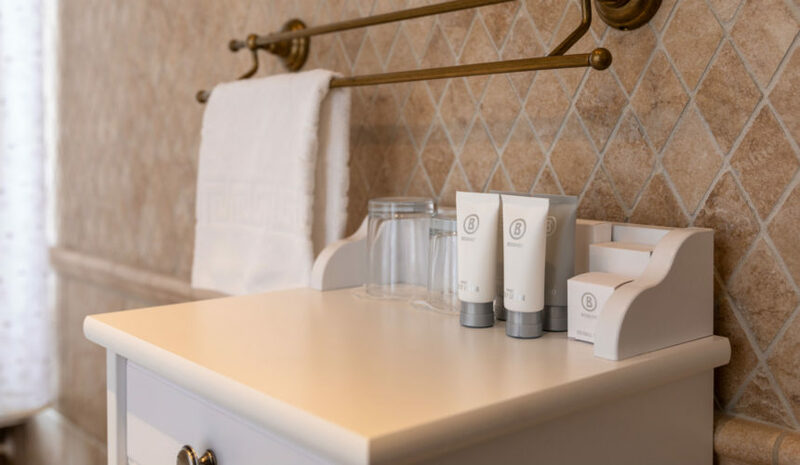   Minibar products can be ordered from reception for an additional charge. 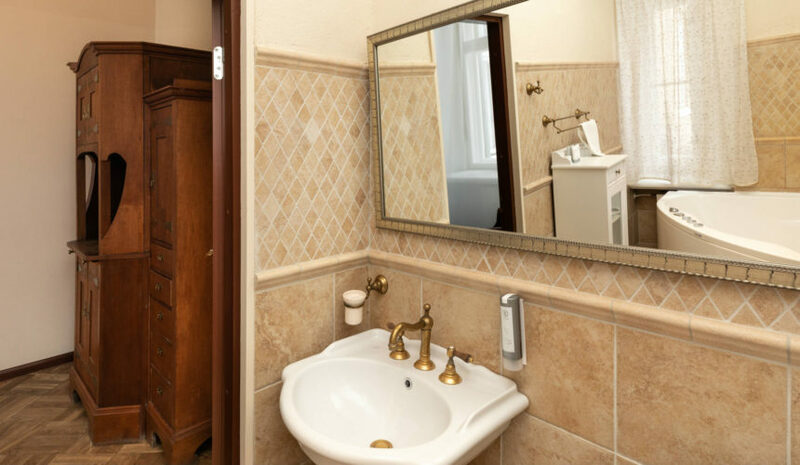 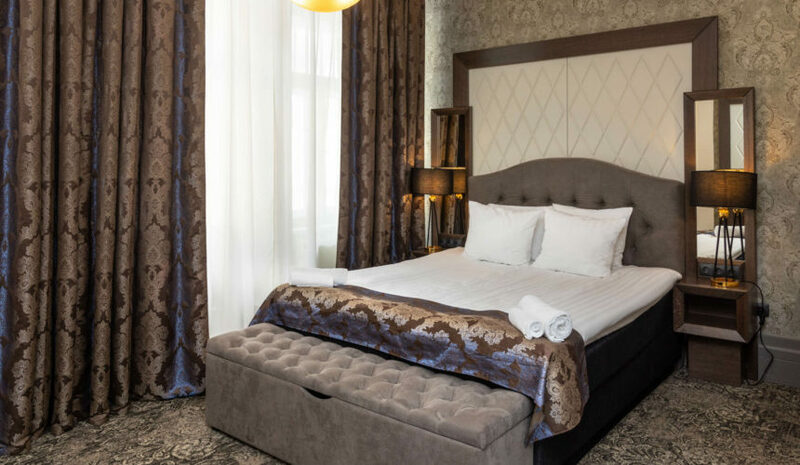 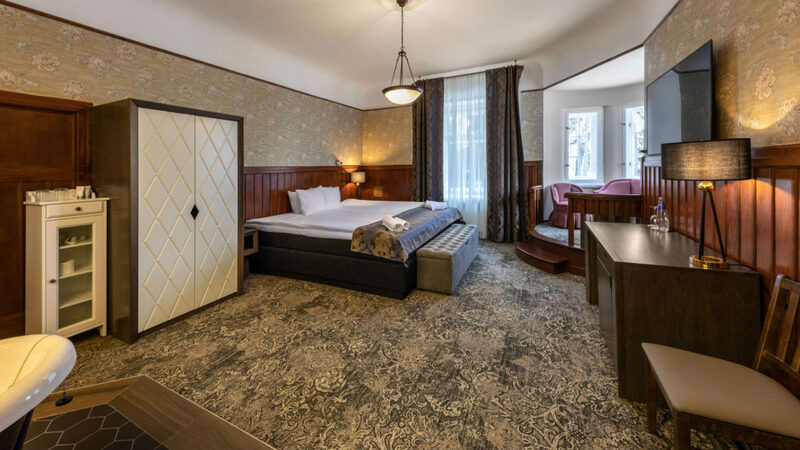 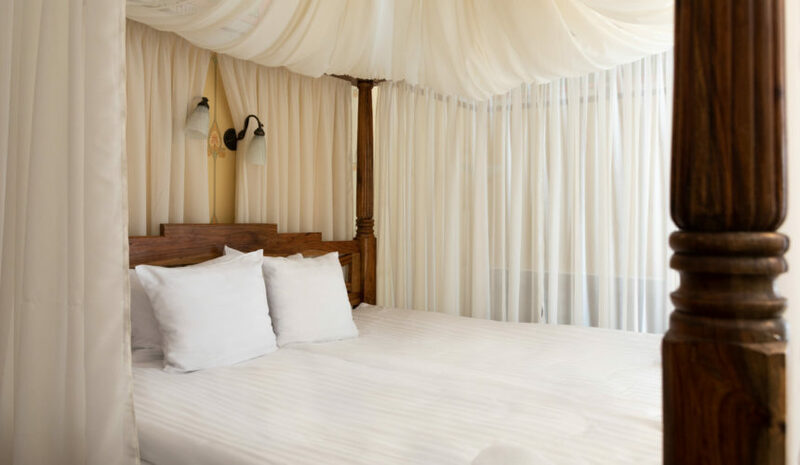 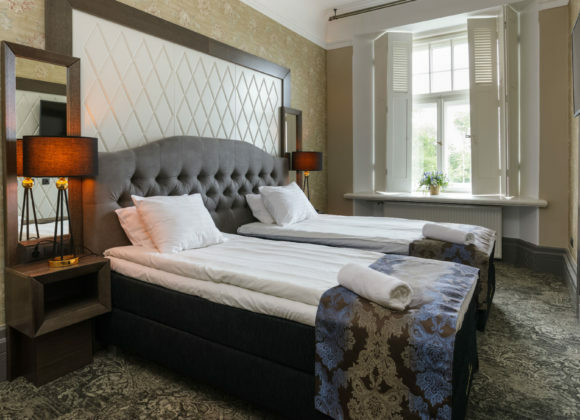 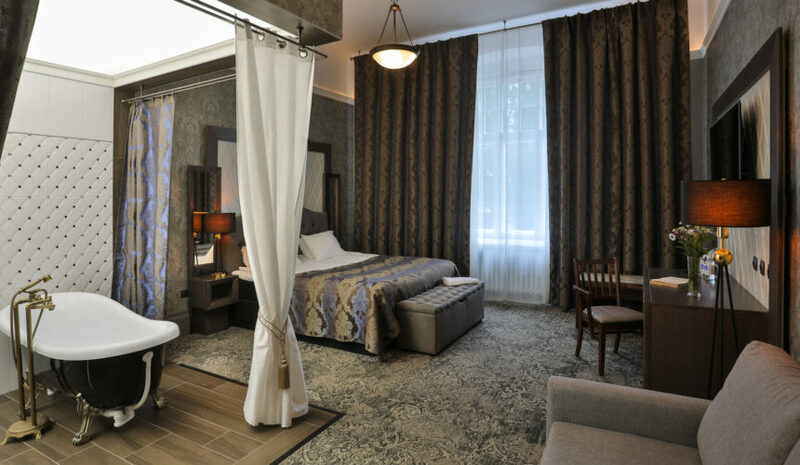 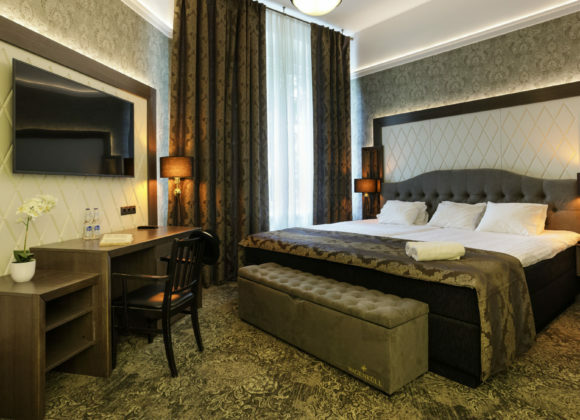 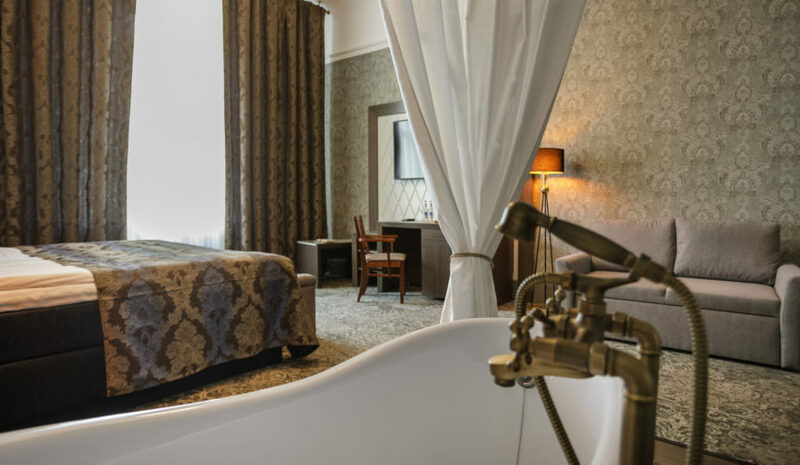 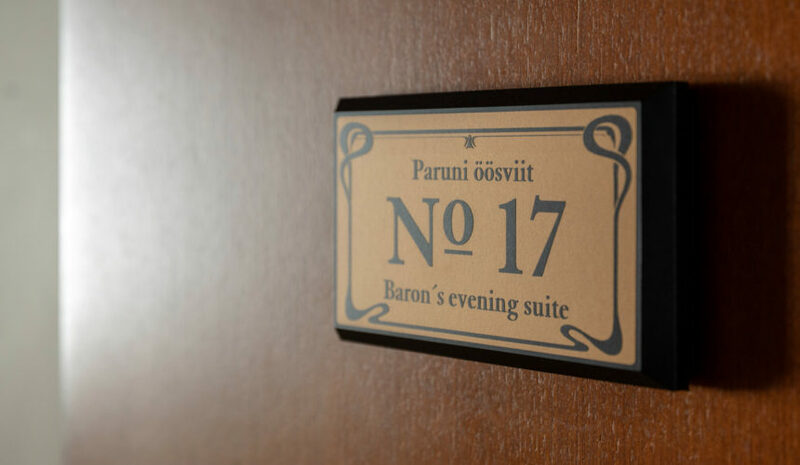 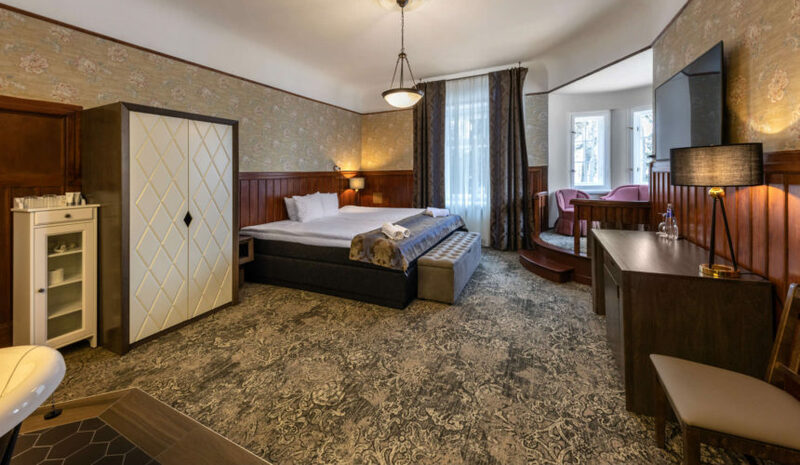 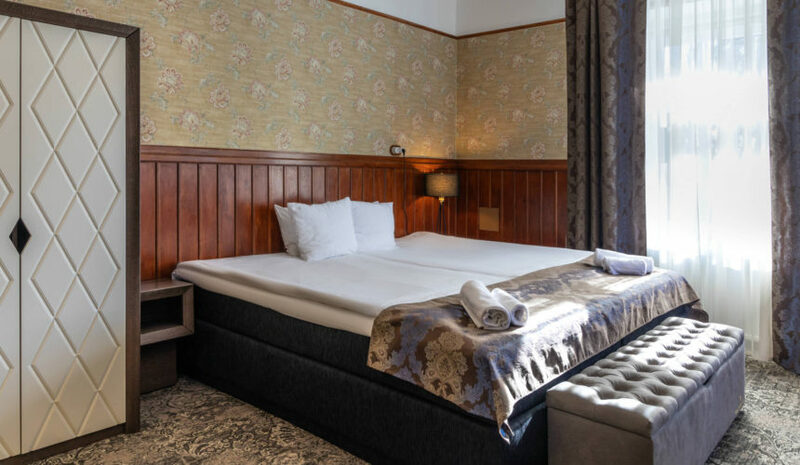 Suite is situated in the art nouveau style castle, in which the restaurants and spa and sauna complex are also located. 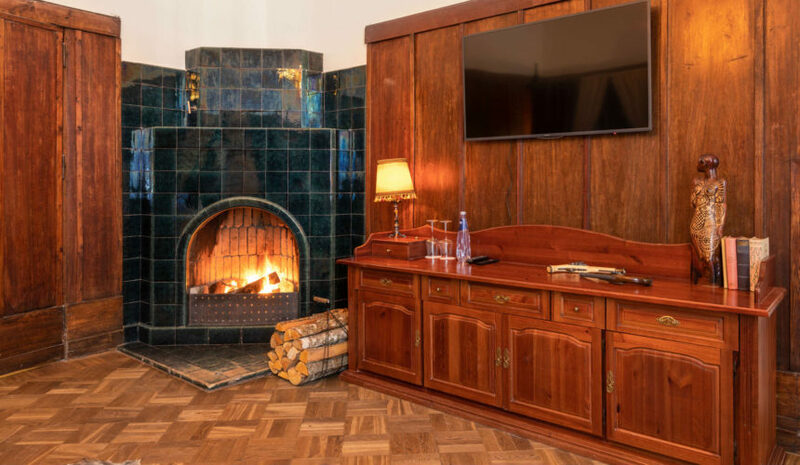 Located within the Governor’s House, with its beautiful wooden architecture.